A historic 2015 for Costa Rican riders put the tiny Central American country on the map of world surf yet again. With their first ever International Surfing Association (ISA) World Games title and a national best, eighth-place finish at the highly competitive World Junior Surfing Championships in October, the future looks bright. Led on the world tour by 22-year-old Carlos “Cali” Muñoz, 19-year-old Noe Mar McGonagle, and his sister, 16-year-old Leilani McGonagle, Costa Rica’s golden generation of surfers has arrived. Muñoz and Noe Mar both finished in the top 50 of the World Surf League’s Qualifying Series, and young Leilani finished 80th on the women’s side of international qualifying, while dominating the national circuit. Costa Rica’s biggest stars, along with other budding young talents proved that 2015 is just the beginning of Costa Rica being a consistent producer of talented surfers who can be competitive on the world stage. Costa Rica’s aptly-named “Dream Team” came up big at June’s World Sufing Games in Nicaragua, where some of the country’s best surfers came together to top the sport’s best, like the United States, Brazil and Australia. On the heels of Noé Mar McGonagle’s stellar, 9.93-point ride, which also earned him the individual gold medal, Costa Rica won its first team world title. 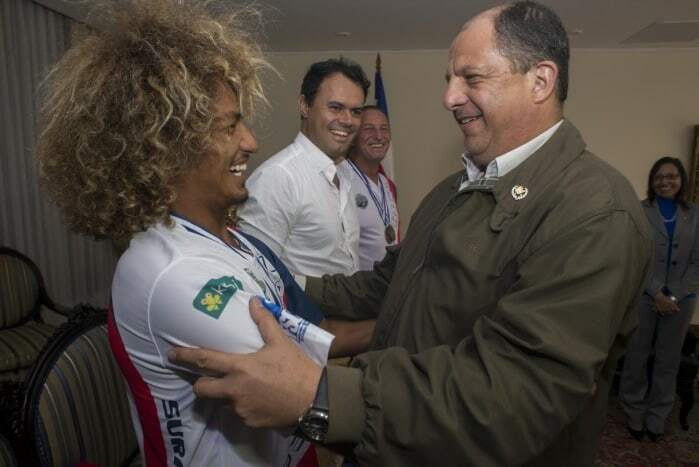 The members of Costa Rica’s championship team, which also included Muñoz, Leilani McGonagle, Anthony Fillingim, Lisbeth Vindas and Jason Torres, became national celebrities, as they were invited to Casa Presidencial by President Luís Guillermo Solís. Despite not receiving much funding from the government like other countries, Costa Rica’s riders came through in the biggest moment. “These surfers are another example of this extraordinary talent that shines in many tough conditions,” Solís said. Nearly every one of Costa Rica’s top surfers are under 23 year old, and much of this year was defined by a rising swell of teenage surfers that look to lift Costa Rica to even further heights. Behind “elder statesmen” like Muñoz, Noé Mar McGonagle and Fillingim, an even younger group of riders proved in 2015 that they’re on track to supersede the country’s current top surfers in coming years. Malakai Martínez, who Brenes says is better at his age than Muñoz or McGonagle were when they were 14, is the country’s next big star in the waves, as he showed on the national and international circuits this year. Along with Óscar Urbina and Aldo Chirinos, the boys’ 2015 national champion (15 and under), the talent is there for years to come. “These are the guys who are going to be world champs in four years,” Brenes said. For her part, Leilani McGonagle is already the best women’s surfer in the country and will only improve on the world tour. In 2015, she helped Costa Rica win its world championship while also having a big year individually at the national events, where she earned a third junior (17 and under) national title. 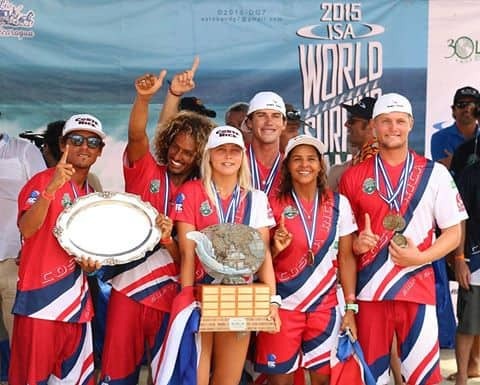 With those impressive youngsters in tow, Costa Rica made history later in the year with its eighth place finish at the ISA Junior World Championships, which are considerably more competitive than the ISA World Games. While the top surfers in the world usually decide to opt out of the World Games in favor of their World Surf League tour events, they always surf in the Junior World Championships as young riders. Kelly Slater. John John Florence. Gabriel Medina. Promising young names like these are always at the Junior World Championships as they blossom into the sport’s best. The eighth place finish at this year’s games was validation that Costa Rica is growing into one of the better surfing countries, despite not having the enormous amount of public support that countries like Brazil and the U.S. give to their surfers. “You have an enormous amount of young talents who have the oceans as their courts, but they’ve been overlooked in favor of other sports,” said ISA President Fernando Aguerre of the current state of Costa Rica surf. And even without much backing, these young surfers like Leilani McGonagle, Martínez, and Chirinos helped prove that Costa Rican surfers can compete, and win, on the world’s most competitive stages.